Gluten-Free stuffing that is bursting with flavor, simple to make, uses only ten ingredients, and is perfect gluten-free stuffing recipe for baking or stuffing a Turkey. This gluten-free stuffing is dairy-free and has a vegan option. It’s stuffing season and I’m super pumped to share with you my favorite recipe for gluten-free stuffing. This recipe has been in the family for generations and up until a few weeks ago, I didn’t realize that I hadn’t shared it with you yet. Shame on me! You can have this gluten-free stuffing in the oven in 10 minutes or less. Five of the ten ingredients are spices, so you can see how easy this recipe is. 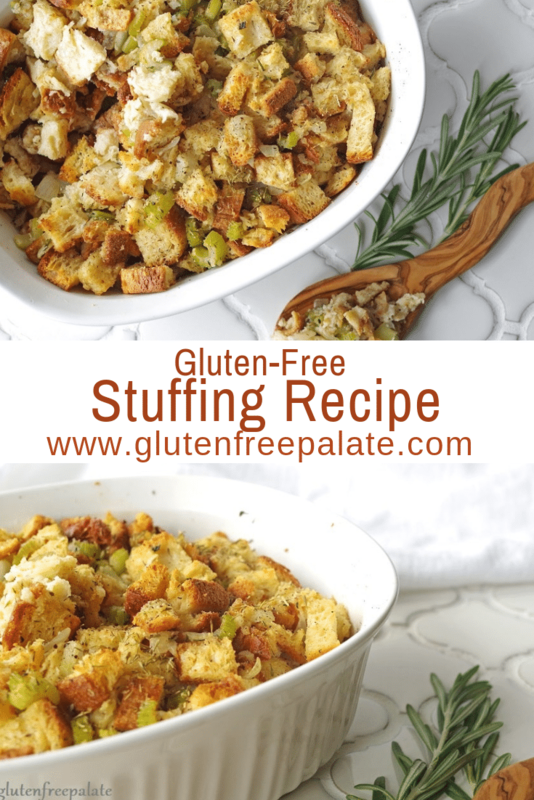 In fact, I made a video below showing you how easy it is to make this gluten-free stuffing recipe. 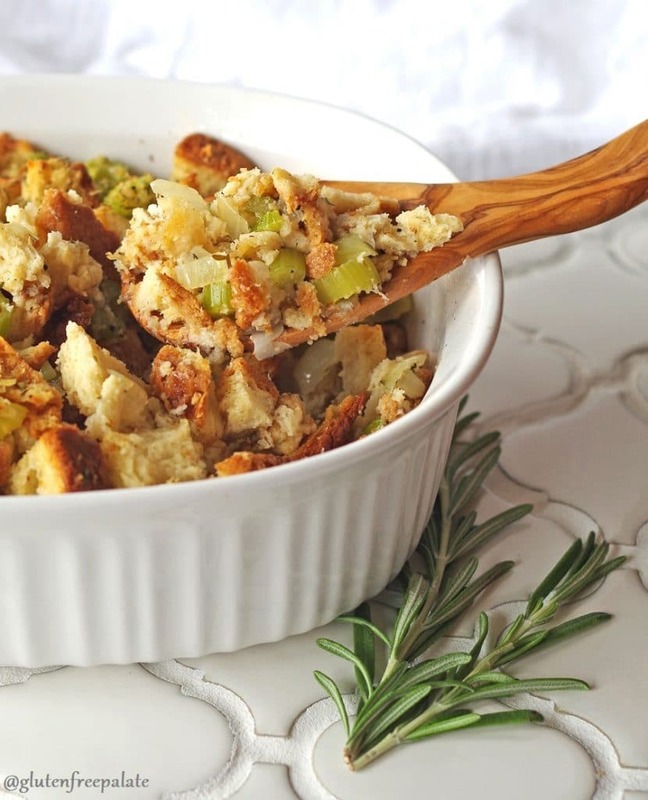 With the holidays coming up, you’re going to want a quick, delicious gluten-free stuffing recipe on hand. This one will not disappoint. It’s not only gluten-free but it’s also dairy-free. But don’t worry, it’s FULL of flavor. For a Vegan option, make sure to use gluten-free, dairy-free, egg-free bread. I don’t know about you, but I don’t like using multiple loaves of bread to make gluten-free stuffing – it gets expensive. Most gluten-free bread loaves are small compared to glutinous bread loaves, wouldn’t you agree? Also, a gluten-free stuffing mix can get expensive. Why waste the money when it’s easy to make your own gluten-free stuffing mix. Let bread slices air dry for 1 to 2 hours, then cut into 1-inch pieces. In a Dutch oven over medium heat, melt butter. Add onion and celery and cook until the onion is soft and translucent. Stir in thyme, sage, rosemary, salt, and pepper. Add bread cubes and mix until evenly coated. Drizzle broth over the bread mixture and toss until well mixed. Stuff turkey, or bake in a greased 2.5 qrt casserole dish at 350°F (180°C) for 35 to 45 minutes. If you don’t have a dutch oven, you can make this gluten-free stuffing recipe in a large boiling pot, or pan. This gluten-free stuffing recipe feeds 8-10 people, or 6 people who are really big gluten-free stuffing eaters. It stays good in the refrigerator for up to three days after its been prepared. I use Canyon Bakehouse bread in my recipe, but you can use your favorite bread. Just make sure to use equal amounts. Earlier Canyon Bakehouse came out with a big loaf of bread, their Heritage Style Loaves. It’s wide, it’s delicious, and it’s my new favorite loaf of bread for making all things related to gluten-free stuffing. You can check out their store locator to see if it’s carried in your area. Canyon Bakehouse loaves are gluten-free, dairy-free, non-GMO, whole grain, and they include clean ingredients. The Heritage Style Loaf has all the same qualities as the standard loaves, but the slices are much bigger! In this case, bigger is better. 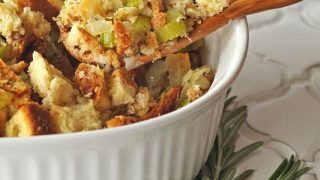 You can use fresh or stale gluten-free bread in any of these recipes, including this gluten-free stuffing. Whether you’re hosting a gluten-free Easter, Gluten-Free Thanksgiving or Gluten-Free Christmas, or bringing a side to a holiday potluck, this recipe is allergy-friendly and works well with most diets. No need to go to the store searching for a gluten-free stuffing mix, this one will please even the pickiest of eaters. Can I use turkey drippings instead of broth? Heck yeah, you can use turkey drippings instead of broth. The turkey drippings may be a bit stronger in flavor. Consider adding a touch of water to make it more broth-like. 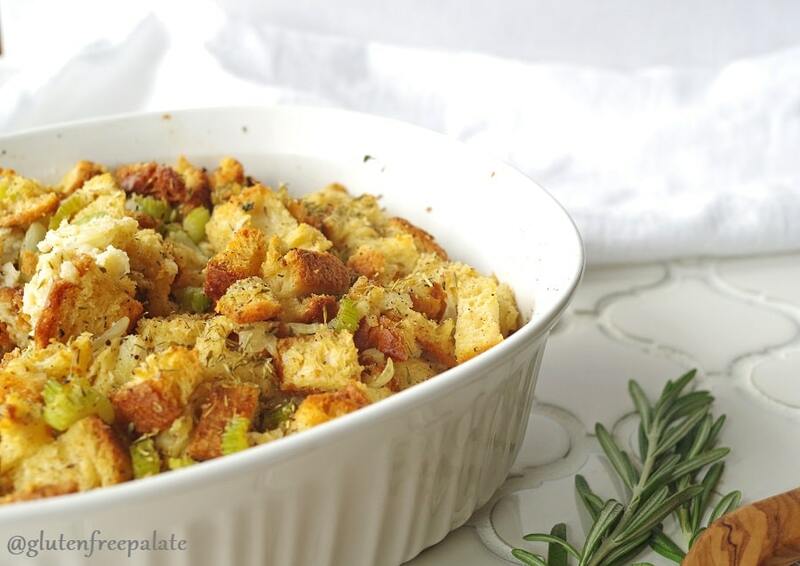 Can I add sausage to this gluten-free stuffing recipe? Yes, you can add sausage to this gluten-free stuffing recipe. Every once in a while my family requests that I add sausage to switch things up. If you want to add sausage, simply brown a half pound of sausage (more or less to taste) and mix it into the stuffing mix before you bake it. You can use a spicy sausage or keep to the flavors and use a breakfast sausage with sage. I haven’t tried an egg-free bread in this recipe, but I know that Katz and Schar both make gluten-free, egg-free breads. A lot of my readers have had great results with Schar bread in gluten-free stuffing recipes, especially with their deli style breads. If you are looking for other sides to go with your holiday meal you might want to check out my Parmesan and Dill Roasted Potatoes, and my Five Minute Gluten-Free Gravy. You might also like this Gluten-Free Green Bean Casserole. 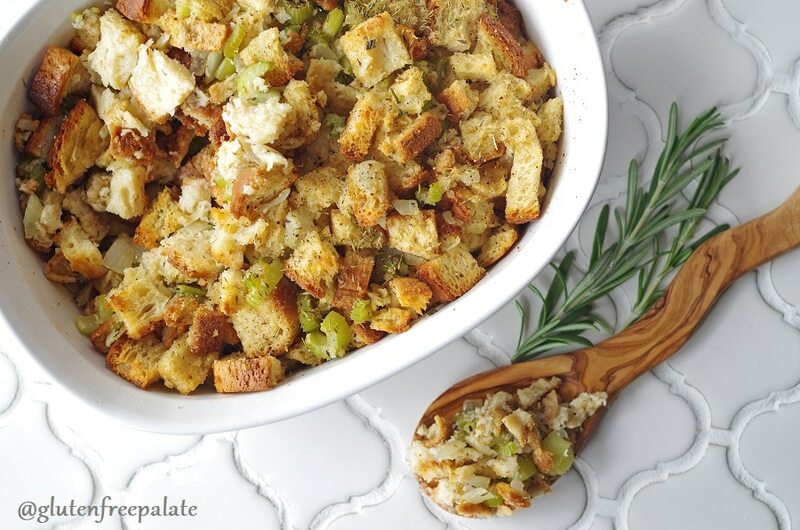 Did you make this gluten-free stuffing recipe? 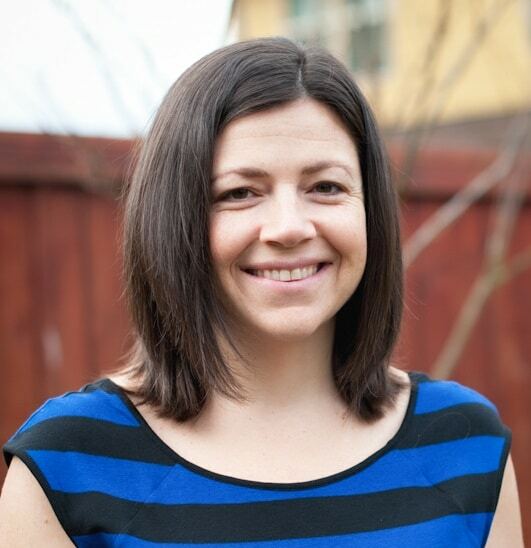 Stop back by and let me know what you thought. Also, if you have any questions please leave a comment and I will get back to you. Gluten-Free stuffing that is bursting with flavor, simple to make, uses only ten ingredients, and is perfect for baking or stuffing a Turkey. 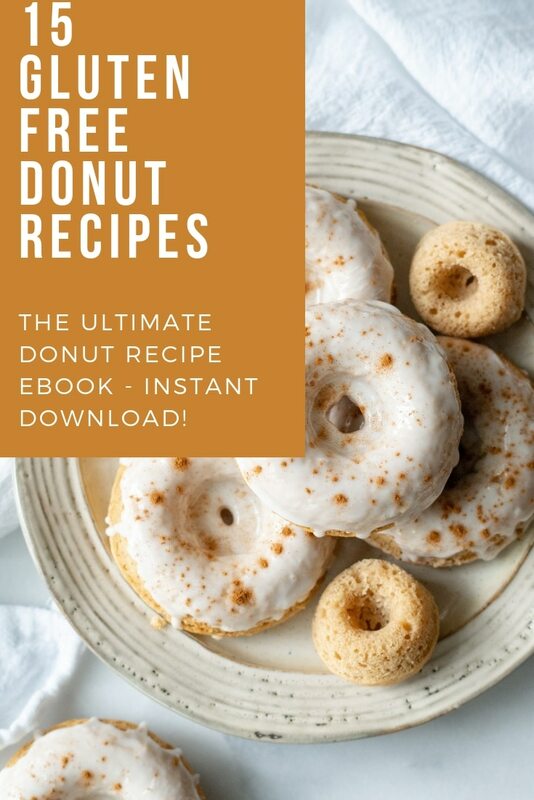 I am so excited about this recipe, Chrystal! We make an apple sausage stuffing that is not suitable for everyone’s diet in our family, so I can’t wait to share this recipe with them. Also, I believe that thyme is a totally underused spice and I love that you added it here! Yum! What a great post for the upcoming holiday! Is it bad I’m already excited for Thanksgiving?! I really need to find this bread – it looks so good! the stuffing does too – cannot wait for holidays! Stuffing is by far, the best thing on the table during Thanksgiving! In fact, we have it again for Christmas since its too good to only eat once. I think I’m the only person in the US who doesn’t like traditional Thanksgiving food – with ONE exception – stuffing!! This looks like the perfect special dish for any night to me Chrystal. Can’t wait to try this! Bought a boxed gluten free mix last year and it’s was awful! I would add sausage also. 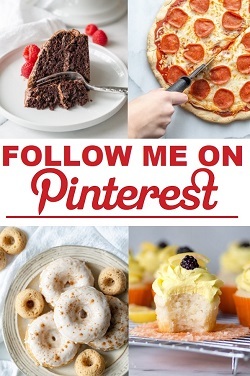 I also love this recipe but my grandson can only have egg whites, any other ideas for bread ? I know Katz gluten-free makes an egg free bread. There might be other bread companies that do as well. Oh! And Schar makes egg free bread as well. I find them the most in my stores. Does anyone know how many servings this yields? We have 14 stuffing eaters to serve in our family! I’ve never made this and frozen it. We usually make it day of, or the day before and reheat. When I use canyon bakehouse bread, it tends to hold together, and not get grainy. Hope that helps. This would serve 8 – 10 people. Where do you find bakehouse honey white bread? I find it at my local Target and Winco stores. You can always use the same amount of there other types of bread, if you can’t find honeywhite. Hope that helps. Can you make this using your whole grIn bread ? You can make this recipe using the Canyon whole grain bread. I haven’t tried it with other whole grain breads. I noticed this recipe does not call for 1 or 2 eggs at all. Is that correct? A couple of the other Canyon Bakehouse recipes do list eggs on the dressing ingredients. This recipe does not call for eggs. I am hosting my sister for Christmas this year and she is celiac so I thank you for this recipe. I will halving the recipe and I’m not sure, since I live in Canada, if that bread is available. However, I’m guessing any gf bread would do. My question is, could I make this the day before and just keep it in the fridge overnight or would it get too mucky? Thank you in advance. Thank you for stopping by. I haven’t tried this with other gluten-free breads but I would imagine it would work with any gf bread that doesn’t use a nut flour in it.